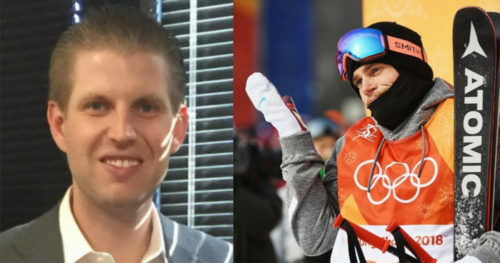 Eric Trump said he finds it “disgusting” that Gus Kenworthy struck out at Ivanka Trump in a tweet that asked what she was doing at the Olympics during the final weekend of the Games in South Korea. Ivanka Trump, who is an official adviser to her father, was in South Korea not only to attend the games, but also to meet with President Moon Jae-in. Kenworthy is not the only one who was less than thrilled by her presence in the country. The decision to send her there is causing increased tensions in the White House, with some senior officials objecting, CNN reports. Eric Trump appeared on Fox & Friends yesterday, where he was asked his reaction to Kenworthy’s tweet. “I think it’s disgusting,” he said. “So, to hear that, that’s not what the Olympics is about. Politics should not enter into the Olympics,” he continued. When asked if it bothered him, “as her brother,” he said that it did. “Yeah, it does bother me, and it should bother us as a society. Can you imagine if Sasha or Malia [Obama] went over to the Olympics and somebody said that about them?” he added. Kenworthy also criticized Vice President Mike Pence’s role leading the Team USA delegation, following in the footsteps of his fellow openly gay Olympian, Adam Rippon, in calling into question why someone with anti-LGBTQ views would be chosen to lead a team with three openly gay athletes on it. He joked when he broke his thumb that at least it meant he wouldn’t have to shake Pence’s hand.